Global Hospitality Services will showcase Emaar Hospitality Group to leisure and corporate segments in key strategic markets underlining its service standards and innovative lifestyle experiences. 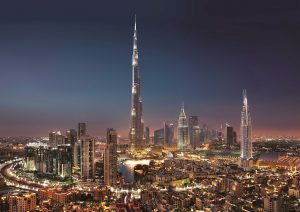 Emaar Hospitality Group has been at the forefront of innovative and modern lifestyle travel, highlighted by its three hotel brands – the premium luxury hotel and serviced residences brand, Address Hotels + Resorts; the upscale lifestyle hotel and serviced residences brand, Vida Hotels and Resorts; and the new contemporary lifestyle hotel and serviced residences brand, Rove Hotels. The diverse portfolio is innovative and futuristic as it meets the assorted desires of the modern business and lifestyle traveller. Emaar Hospitality Group is truly shaping the hospitality industry and GHS is proud to be partnering with Emaar Hospitality Group to further strengthen its global brand reach. The partnership will cover the majority of key global markets such as the Americas, United Kingdom, Europe, India and China. Address Hotel + Resorts, the flagship hotel brand of Emaar Hospitality Group, has brought a fresh identity to the global hospitality and service sector by setting new benchmarks with its gracious hospitality and exceptional service standards. Positioning its messaging as ‘Where life happens’, Address Hotels + Resorts offers a more personal and engaging experience to guests in a premium lifestyle environment, enriching the lives of its guests with luxury, style and elegance. Vida Hotels and Resorts is a refreshingly different upscale lifestyle hotel and residences brand for the new generation of business executives, entrepreneurs and leisure travellers. Vida, meaning ‘life’ in Spanish, embraces warmth, simplicity and creativity in design-led spaces. Positioned as a lively and vibrant hub where inspiring minds can create, connect and come alive, Vida Hotels and Resorts are a stimulating environment where style meets convenience and interactivity. Designed for the new generation traveller who recognises value, stays connected through technology and gravitates towards culturally-inspired surroundings, Rove Hotels defines a new niche in Dubai’s vibrant hospitality sector. Rove Hotels are reliable, modern, fuss-free and super-efficient for the young and young at heart who lead fast-paced urban lives. Efficiency and technology are the watchwords at Rove Hotels which will resonate to the mindset of the highly mobile socially connected global nomads, who explore without borders. GHS looks forward to placing the visionary and innovative lifestyle hotel brands of Emaar Hospitality Group on the global market, as it shapes the future of lifestyle travel for all.